We’ve previously talked about your child’s fine motor skills during the first years. At this stage a question might arise “Which hand is my child going to write with?”. Hand preference or dominance is a set of complex developmental processes that begin before birth and expand during the early infancy. For most children hand preference emerges between 2 and 4 years of age. Every child develops at his own pace, so there’s always some that will show preference before or after that. Your little one will start reaching for objects at around 6 months and you might see a preference in using one hand, but this can change over the course of the next months. At about 10 or 11 months, he’ll start showing more precise movements as he flips through book pages and manipulates toys that have wheels. At around 14 months you’ll notice he’s able to do detailed tasks like inserting coins in a piggy bank. Research shows that hand preference stabilizes at around 18 months with 80% of toddlers maintaining the same preference until reaching 24 months. Studies have shown that hand preference is linked to differences in hemispheric specialization on language skills, word processing, and a wide range of performance differences on tasks of cognitive, social, and emotional functioning. We’ve previously talked about how object manipulation influences the way infants experience their world and impacts on their language ability. Studies observing hand dominance in children show how consistency vs. inconsistency from infancy through toddlerhood explained 25% of the variance in language abilities at 2 years of age. Language outcome at 3 years in the same sample found that children with a consistent hand preference trajectory as toddlers had higher expressive language scores. Findings also show that children with stable hand preference are better at manipulating objects and are better multiple object users. Stacking, object construction, object management, and object storage (placing objects in reachable locations) have been shown to be more effective in children with consistent hand preference. Tool use is an important cognitive and physical skill that involves imitation of complex actions, planning, decision-making, and the ability to account for spatial characteristics of objects, their properties, and the situation. This skill was observed in 60 children between 10-14 months. Findings showed that in successfully completed tasks and actions that involved using objects, infants with consistent right- or left-hand preference out-performed those without a hand preference. Studies also show that establishing a hand preference early on has an impact in your child’s manipulation of objects and on important processes of his cognitive and linguistic development. What can you do to help your little one? It’s important not to force your son to choose one hand, but instead provide plenty of opportunities and a wide range of play activities for him to practice. Encourage activities that involve using both hands and require hand-eye and bilateral coordination. For example, when placing objects in and out of a container, one hand stabilizes the container while the other picks up the objects (One hand is in charge of doing and the other hand is in charge of helping). Construction play with blocks helps him learn to position his fingers and maneuver objects. Opening jars, twisting cap bottles, and opening doors or cabinets also foster his object management skills. 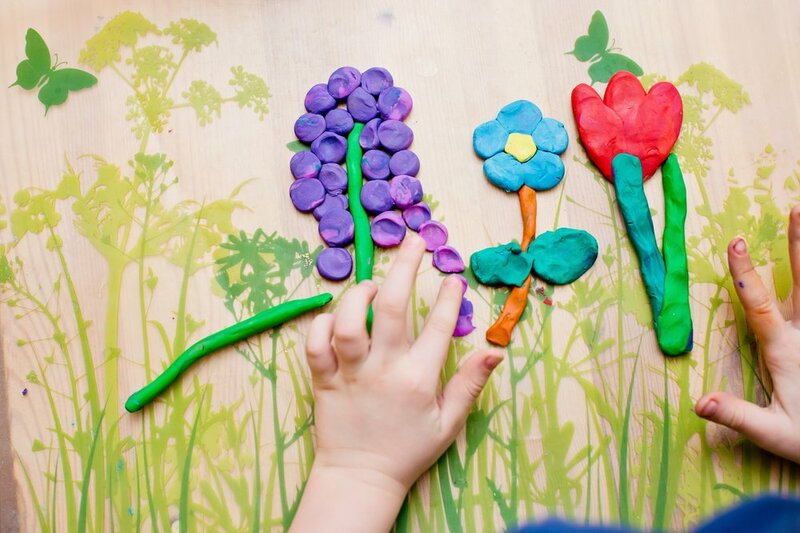 Scribbling and exploring with different art materials, such as playdough, will help him strengthen his hand and finger muscles and be able to manipulate objects with the hand of his choosing. Threading activities, using utensils, and playing with musical instruments are also fun ways to encourage this. When playing, try to place the items you are using (if possible) in the center or in front of your child. This way he’ll be required to automatically choose a hand to pick them up, as opposed to using the hand that’s the nearest. Remember that big muscles also have an important influence on hand skills, so try to incorporate ball games (throwing, catching, rolling) to keep strengthening his muscles and favor a hand preference.